Indian Navy says it's 'deployed as necessary' after Pakistan says submarine made 'provocative actions'. 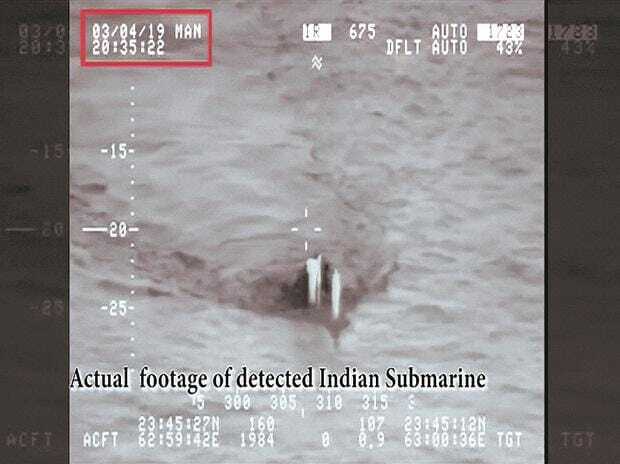 Soon after the Pakistani statement, a video emerged on social media, purporting to be of the detected Indian submarine. It quickly emerged this was a fake video, produced by a Pakistani television channel in 2015.
International maritime law permits vessels from all countries, including warships, to operate freely in international waters, including in other countries’ EEZs, which extend 200 nautical miles from their coasts. A country’s territorial waters extend only 12 nautical miles from its coast; and, even in those waters, vessels from other countries enjoy the “right to innocent passage”. From official Pakistani statements, it is evident that the Indian submarine never encroached into Pakistani territorial waters. That suggests that Indian submarines will continue their peacetime routine of patrolling off the Pakistani coast, without entering territorial waters, but ready to sink Pakistani shipping at short notice if hostilities break out. “We routinely send submarines for patrols along the Pakistani coast, as also into the South China Sea. Pakistan too sends submarines to patrol India’s western coast. And maritime patrol aircraft from both sides play a cat-and-mouse game, trying to detect and identify enemy submarines,” says a former Indian submariner. In this provocative game, Indian submarines enjoy a significant geographical advantage. Pakistani submarines cannot come too close to India’s western coast, where the water is very shallow, since the gradient of the continental shelf is low. In contrast, the water is deep until close to the Pakistani coast, permitting submarines to operate freely without the risk of scraping their hulls on a shallow ocean floor. India operates a fleet of 14 conventional submarines: nine Russian-origin Kilo-class boats, four German-origin HDW boats and one recently-commissioned Scorpene submarine, INS Kalvari, which the Pakistan Navy claims to have detected. Five more Scorpene submarines of the Kalvari-class are under construction and would all join service by 2021. In addition, India operates two nuclear powered submarines: the attack submarine, INS Chakra, and a nuclear ballistic missile submarine, INS Arihant. Pakistan’s navy operates eight submarines: five French-origin Agosta-90B and Agosta-70 boats and three Italian-origin Cosmos-class midget submarines. There is a joint venture with China to build at least six Yuan-class submarines in Pakistan, which will enter service between 2023-2028.